Our entire body is working through the day. The internal organs never stop and keep working. Some of the most active internal organs which never stop working are the heart and lungs. In addition we have hands, legs, muscles and other parts of the body which are involved in some form of activity or another. We feel that all of these external organs or maybe the heart and lungs are the most active parts of our body. This is partially true. There is one part of the body which is most active out of all these at all times. Surprisingly, this is the brain. The brain is the most active part of the body. Even though it is not involved in any physical motion like the arms or legs or muscular motions like the heart and lungs, it does more work than any other organ or limb. This is because the brain (or mind) never stops working. It is always thinking, processing, dreaming, working and directing other parts of the body even while you are asleep. This is not the only form of activity the brain has. The difference is that the brain is also multitasking unlike other parts. Lung has to only be involved in breathing or the heart is involved in maintaining blood flow. The arms are used for grasping and legs for locomotion. The brain has to direct and oversee everything. All internal functions as well conscious external actions are all directed and controlled by the brain. In addition, most of its job is not mechanical. This is because The brain also controls and directs the rest of the body, receives inputs and takes decisions. Now this is a whole lot of work for one small part. We are aware that any activity requires energy. Now try to think how much energy is required by the brain. All of this thinking, processing and directing requires probably more energy than strenous physical activities. In addition, one thing which is definitely required is a lot of fresh oxygen and nutrients all the time, even while sleeping. We feel that when we sleep we need minimal nutrients or energy. This is true in relation to the physical body because it as rest. Even the heart and lungs are very relaxed and require minimal energy, nutrients or blood flow. But the brain keeps working. Even when we are sleeping, the brain continues to require nutrients and energy. This is obtained through one source which is the blood. The purpose for blood circulation is to provide oxygen and nutrients to all the cells and organs in the body. The same applies to the brain. You will be shocked to know that the brain alone requires twenty percent of all our blood as well as blood circulation effort. This is the minimum required to function normally. This requirement shoots up when there is stress, worry or any kind of negative emotions going through the mind. the other organs start getting deprived of their quota of blood. This results in diseases and lowering of immunity. So even if you think you are healthy, you will fall ill if you think too much, worry or get stressed. Excessive pumping of blood to the brain against gravity puts an extra load on the heart. This leads to cardiac problems even without any plaque formation, cholesterol or hardening of arteries. Extra requirement of blood means greater stress on the circulatory system. This may lead to high blood pressure. Greater oxygen requirement will push the lungs to work harder. This could lead to respiratory problems. This is one of the reasons why asthma is also triggered due to stress. 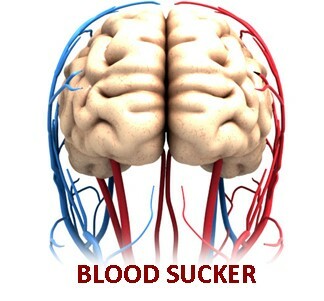 We have now understood that, the lower the blood requirement of the brain, the better it is for us. The more calm we are, the lesser we worry and the lesser we think, the better it is for the mind, heart, lungs and the rest of the body. To calm your mind, opt for our stress management program. This program will help you to improve the mind, reduce the blood flow requirements to normal levels and keep you healthy and relaxed.